Shake the world. Millions of Mustang fans dream of telling a story like Joe Sprague. Unbelievable Mustang mojo landed him this barn find Boss Mustang, with what appears to be a Holman Moody 427. Get this - he almost passed up his chance to own a muscle car icon. Michigan’s Joe Sprague, 38, runs a small Mustang parts business as a hobby. Last summer a long-time friend of the family called his parents and told them that he knew of someone getting rid of some old Mustang parts. Knowing that Sprague dealt in parts he wanted to pass along the contact info. They gave him the go ahead. His parents told Sprague about it but at first he wasn’t that interested. Previous owner bought the Boss in 1973, drove and raced until 1980 then left it parked in storage until 2018. A 2012-2013 Boss 302s was his target car but he couldn’t justify the cost for a vehicle that was only going to be driven a few months out of the year. 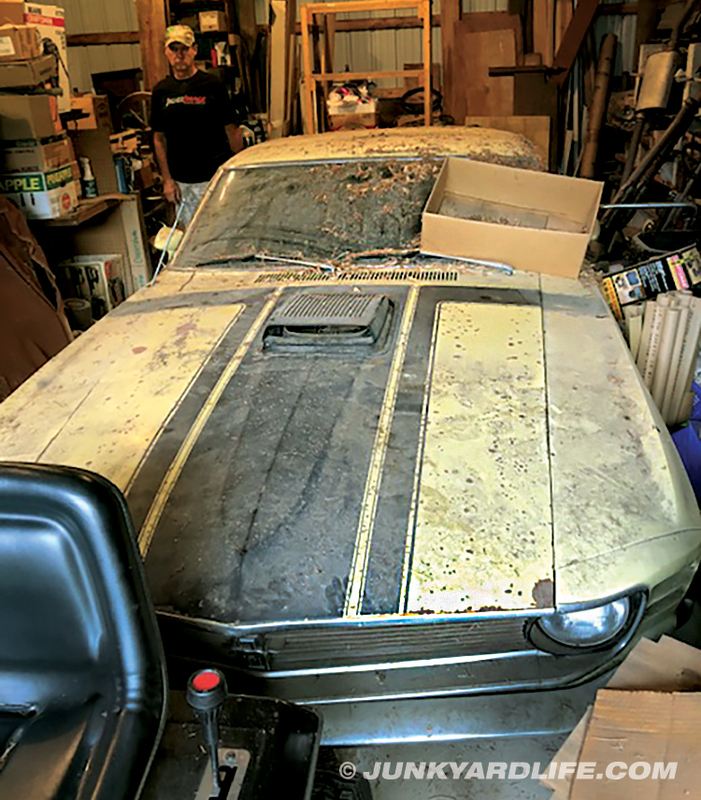 A week after Sprague bought the 2013 GT the long-time family friend finally caught up with him about the old Mustang parts collection and stunned him with some news. Because of Sprague’s recent interest in Boss Mustang models he knew that any 1970 Boss had value. Sport slats and rear wing adorn the back of the 1970 Boss Mustang. Designer Larry Shinoda was responsible for the stripe package and the many visual cues of the "Boss" package, also the name may have originated when Shinoda was asked about the development of the car. "I'm working on the boss's car." He and his boss, "Bunkie" Knudsen, moved from GM to Ford in 1968. 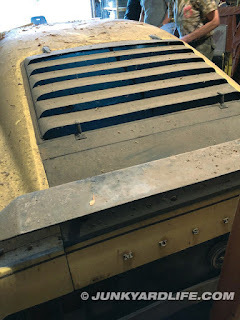 In 1973, a man by the name of Dale, a devout Ford fan, was at work when a friend stopped by and told him there was something on the used car lot at Camps Cars that he would want. Camps Cars was a VW dealer in Midland, Michigan (a town about 35 minutes from where Sprague now lives). Dale drove to the car lot and found a completely stock 1970 Boss 302. The friend knew Dale better than he knew himself because he was right! It was something that he wanted! Gas prices were going up and muscle car prices were bottoming out in late 1973 with gas shortages due to the oil embargo. This was good news for a guy wanting a 1970 Boss Mustang in 1973. And a VW dealership’s used car lot was a good place to pick up a deal. Notice the shaker top is just sitting on the oval lid of the intake. A 427 engine sits in the engine bay replacing the original G code 302-V8. Dale bought the car and started street racing it. In stock form the Boss did well. Around the same time that Dale bought the yellow Boss a friend of his acquired a 1967 Shelby from California. The Shelby was powered by an aluminum head 427. Per Dale the engine was built by Holman Moody. Although it’s hard to verify this, the engine does have the aluminum Holman Moody water pump. Dale always wanted a 427, and since that was not the original engine to the Shelby, Dale and his friend swapped engines. Out came the G code 302 and in went the 427 (side note: the original Boss drivetrain was ultimately destroyed in a garage fire). With the new engine (plus 4.30 gears swapped in the back), the Boss instantly became a street racing hero. Dale never took it to the track, but he did beat a well known Chevelle that was a drag strip regular. That Chevelle was very quick and was a consistent 12.5-second car in the quarter-mile. For 45 years Dale held onto the Boss. The car was driven up until about 1980 and then parked. Dale, a devout Ford fan, was the type of guy that didn’t get rid of things. Dale, and his wife, ready to downsize and move to a retirement property in Northern Michigan, decided to sell the Boss in 2018. Among other things that needed to be attended to before the move could be made was getting Dale’s 1993 Cobra (bought new) back on the road. Dale took it to a mechanic and happened to mention that he was selling his stuff. That mechanic told Sprague’s family friend about it. Small world. What could be better than hauling a Boss barn find home? This ’70 Boss sat for 38 years before coming out of hibernation. Through the years there was one person that Dale always thought would end up with the Boss, but sadly that gentleman died from a heart attack in 2017. As far as Boss 302s go, this car wasn’t highly optioned, but it did come with the three most popular Boss options. The spoiler, the window slats, and the shaker. Sprague ordered a Marti report to confirm vehicle details. The car was sold new at Bill Grimes Ford of Midland, Michigan. Dale was the second owner. Sprague is now the third owner and keeps the ’70 Boss in storage until he can find time to restore it or possibly put it back on the road as it is. Either way the 427 will remain as the power plant. 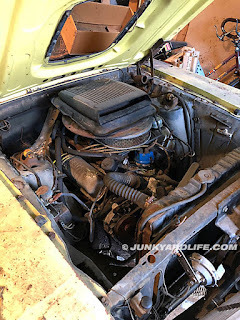 Sprague would love to know what the engine came out of as factory aluminum heads were not common (GT40 and the 427 Cobra being the only two that he is aware of). Yellow was the most popular Boss color in 1970. Always follow your leads, no matter how small or uninteresting you think they may be. Joe Sprague got lucky with this 1970 Boss, next time maybe you will too!